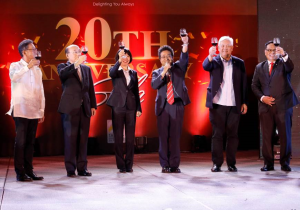 CMPI President and CEO Kazuhiro Ozawa (3rd from right) led guests to a toast to celebrate Canon’s 20th anniversary in the country. In photo with him from left to right are Makoto Iyori, Minister for Economic Affairs of the Japanese Embassy in the Philippines; Kazuhiko Yamada, President of Canon Business Machines (Philippines), Inc.; Noriko Gunji, Canon Singapore President and CEO; Kazuhiro Ozawa; Frederick Alegre, Assistant Secretary of the Department of Tourism; and Jojo Bolima, Senior Director for Office Imaging Products of CMPI. Manila, Philippines– Inspired by its 20-year success in the country, Canon Marketing Philippines, Inc. (CMPI) sets sights on a new chapter of delighting Filipinos to further strengthen its business in the Philippines. Spearheaded by a new regional and local leadership, the company aims to hit double-digit growth year-on-year in the next 20 years by starting it right this 2018. Ozawa’s key priorities include, first, the commitment to continue Canon’s mission of delighting all of its stakeholders always. Secondly, he aims to be closer to customers by improving the level of speed of Canon’s services, and making its products more accessible through increased coverage and regional presence. Lastly, the company will continue to be more aggressive in the business-to-business segment with the belief that “Business Can Be Simple” through Canon. Through its input-to-output, end-to-end technologies, Canon aims to simplify and optimize workflow that leads to cost and time savings for businesses. Meanwhile, the appointment of Anuj Aggarwal as the new Vice President of CMPI was also part of the strategy of Canon Asia Marketing Group (CAMG) to promote local talents in all countries, including the Philippines. “The Philippines is one of the fastest growing economies in the world. As a matter of fact, it is the second fastest growing economy in Asia and, if we go by the forecast, it will continue to grow at an even faster pace in the future, too. Also, its population is one of the youngest in the world. The youth are booming with confidence to achieve more and challenge the limits. With this, our aim is to make CMPI as the fastest growing national sales office in the CAMG group. This growth will not only increase our investment in the market in terms of marketing spend but also provide more employment opportunities to the local community,” said Aggarwal. Established in December 18, 1996 as a subsidiary of Canon in Asia, CMPI has been going from strength to strength in delivering breakthrough technologies to Filipinos to help improve their personal and professional lives. At present, it ranks among the Top 500 of the Philippines’ Top Corporations, and continues to be a strong and trusted brand for imaging and printing solutions in the country.